Sharing? What is that? The most dangerous thing about making crazy delicious alfredo is that I always want more and more, until I’m in a food coma and can’t move from the couch. Oh alfredo, you wonderful gluttonous devil, you. 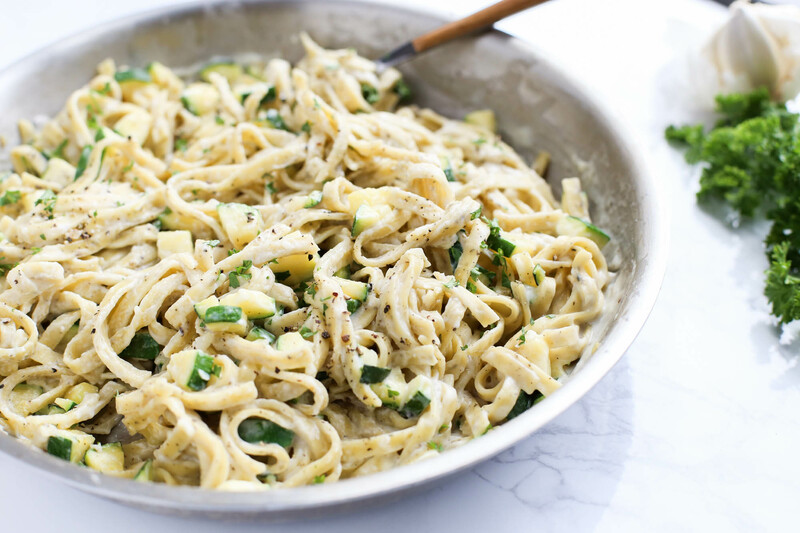 But what if alfredo could be lighter, healthier, less of a guilty pleasure and more pure plain enjoyment? I have a recipe for that. You’ve found it. On my scale of the very best comfort foods, alfredo is only second to macaroni and cheese. I kind of have a thing for carbs and cheese. Now you can have all of those wonderful indulgent feelings with little of the guilt that follows. Just don’t tell your husband it’s a lightened-up version. He won’t notice the difference anyways. 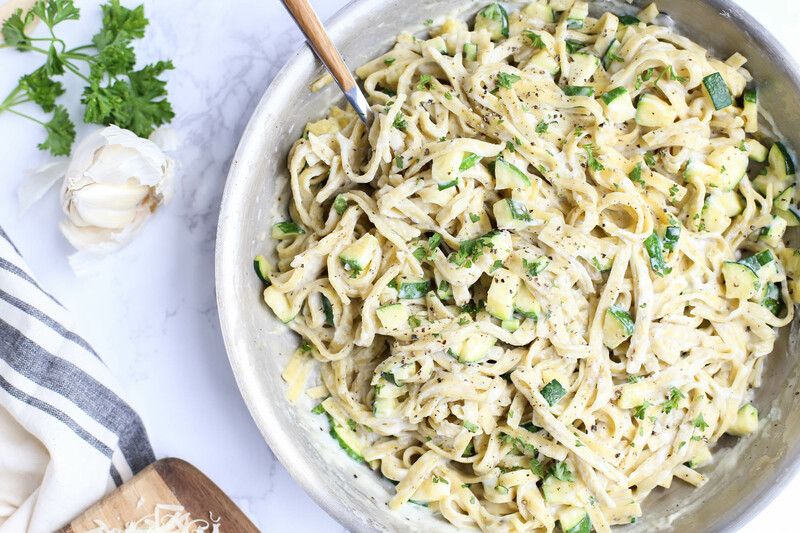 This creamy, healthier version of alfredo sauce cuts out the heavy cream and uses low-fat milk, an ingredient you probably already have in the refrigerator. Also the original alfredo recipe I made in the past had a whopping 1/2 lb. of butter. Ooofda, as we like to say in the Midwest. Remember those resolutions you made in January? Yeah me neither but I do know that 1/2 lb. of butter is no good. 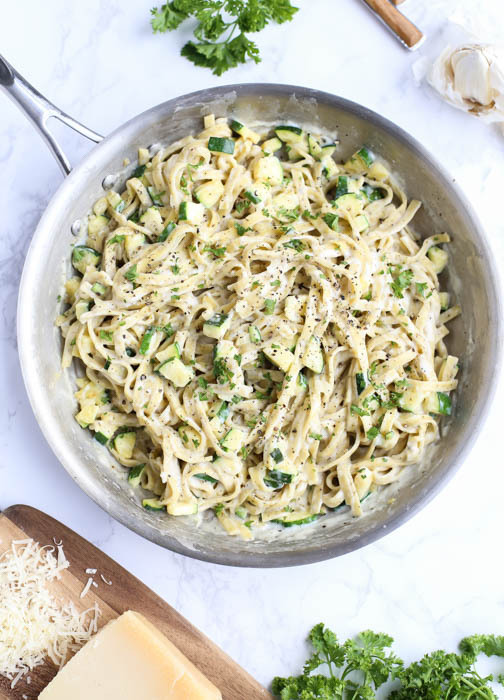 This version is light on the calories without sacrificing any of the creaminess and flavor of regular alfredo. As seems to be a recurring theme here at The District Table, I like to keep things delicious but swap out for healthier ingredients. 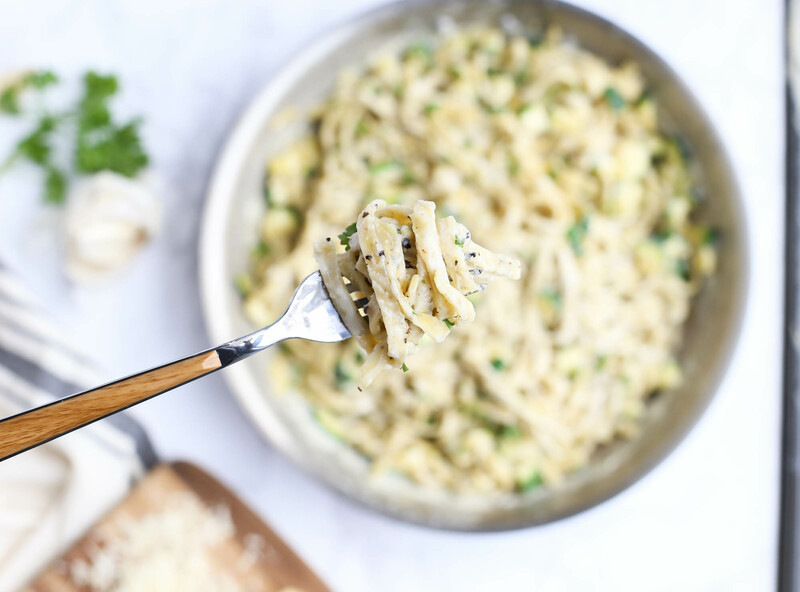 While the pasta is cooking you can pull the alfredo sauce together. Instead of just melting cheese in cream, this recipe is more similar to a bechamel. You whisk milk and broth with a bit of butter and flour and then let it simmer until thickened. 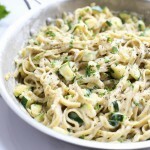 Then toss the pasta and zucchini in the creamy goodness. If the sauce is too thick, add in a little reserved pasta water until it reaches the consistency you like. (And it’s best eaten right away.) Feel free to add in chicken, shrimp, broccoli—anything you want to smother with creamy sauce. Plates? Who needs plates? This is me, slurping down this entire pan of carby goodness. I see a lot more alfredo in my future, thanks to this lightened-up version. Bring a large pot of water to boil and add a generous amount of salt. Cook the fettuccine according to package directions. Reserve some of the pasta water for later. Meanwhile, melt one tablespoon of butter in a large saute pan over medium-low heat. Add the garlic and cook for 1 minute. 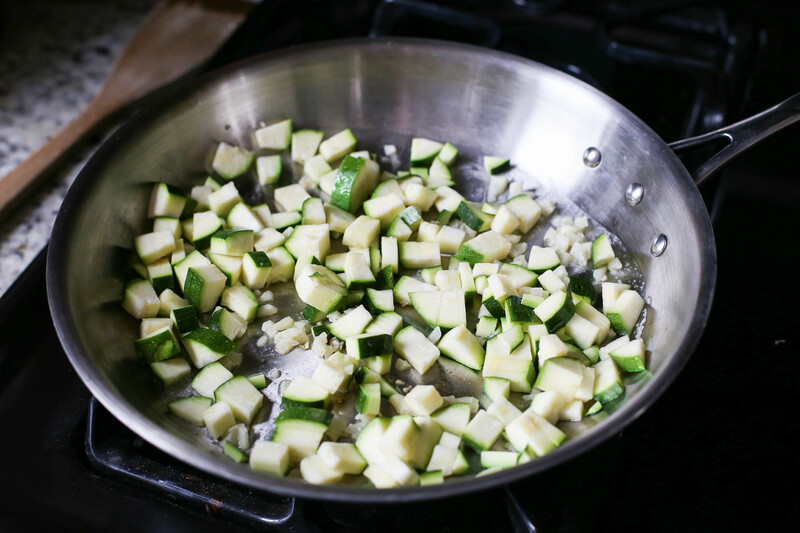 Stir in the zucchini and cook for 5-6 minutes until tender. Remove the garlic and zucchini to a paper towel-lined plate to drain. In the same pan, melt the remaining tablespoon of butter over medium heat. Stir in the flour and cook for 1 minute. Slowly whisk in the chicken broth, followed by the milk. Whisk to combine until smooth. Bring to a simmer and let cook until the mixture thickens, which can take up to 10 minutes. Stir in the Parmesan cheese, salt, and pepper. 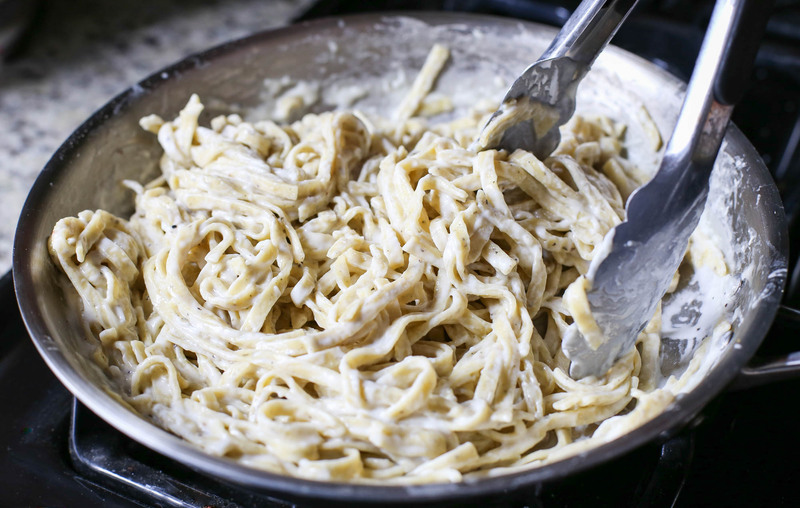 Add the cooked pasta to the pan with the alfredo sauce and stir to coat. Add the lemon zest if using. If the sauce is too thick, add in a little of the reserved pasta water. Stir in the zucchini and adjust salt and pepper to taste. Serve immediately, topped with fresh parsley. Serves 4-6 depending on whether the pasta is served with a side dish or salad.